Click HERE to make your Capital Campaign donation today! The capital campaign is our new fundraiser at JBE this year where 100% of the funds stay right here at our school. We are looking to have 100% participation among families and teachers. Currently 75% of our teachers have given to the cause but only 20% of our families! Let's even the score! You can track our participation here! We are pushing to be at completion by November 20th so we can budget for the spring and next year. All classes with 100% participation will have a popsicle party! You can read more and donate directly on our website. Saturday - 11/3 - Save the Date - JBE Fall Festival: Plant Sale at the Greenhouse, Turkey Trot and more!! Are you looking for ways to get involved, we try to keep alist of ongoing needs updated on our website! I know we have quite a few more spots to fill in the front office and also helping our new librarian, Ms. Benton! Friday - 9/7 - Grandparents Day! - Grandparents are invited at 7:30 to have breakfast with their JBE student. More details and RSVP to come from the school. 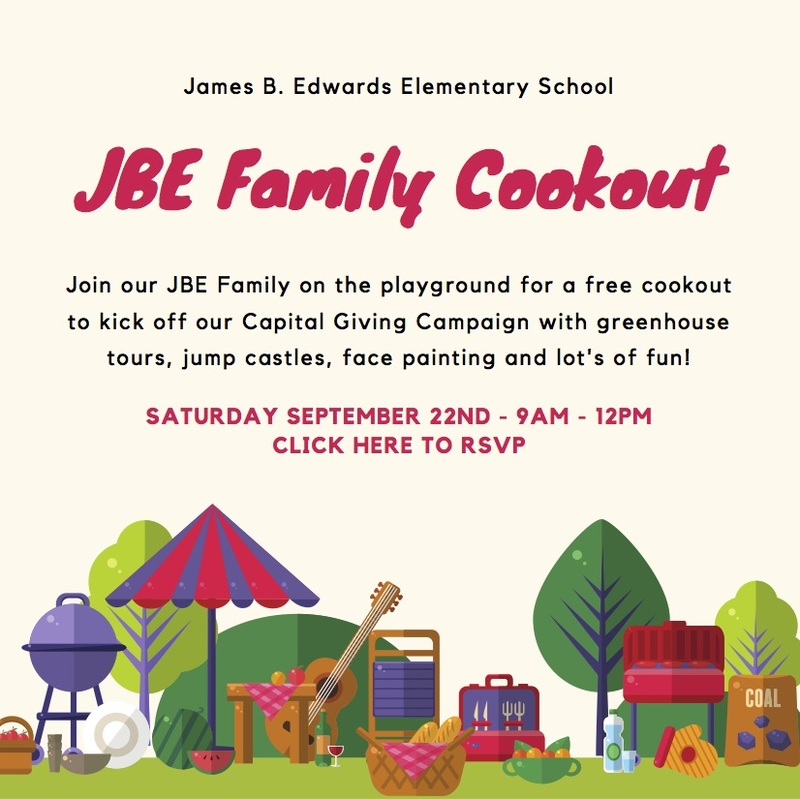 9am - 12pm - Plan to come to spend the day with the JBE family celebrating our accomplishments and planning for the future! No longer want to receive updates from the JBE PTO? Hello everyone! We look forward to having back at school on Monday August 20th! Please make sure you have your school supplies. You can check your list here . Check out the new Greenhouse! Our teachers can't wait to get the kids in this new learning environment. Look for more on this the second or third week of school. Hi Friends - Please visit the James B Edwards district website to get your 2018-2019 school supplies list. The PTO is proud to report that we have been hard at work over the summer. The foundation has been laid for our greenhouse and work is scheduled to be complete by the beginning of school. We are very excited for this unique opportunity to expose our kids to hands on gardening and farming while using the vegetables grown for our Backpack Buddies program. Many thanks to our Green Team, specifically Ms Platt and Kimberly Crane, for their hard work in making the greenhouse come to fruition. For those of you who may not know, the greenhouse is the culmination of close to 5 years of fundraising! The Green Team and Principal Fountain have met and prepared lesson plans to make the most of students time in the Greenhouse. Next on the JBE PTO summer agenda is an updated website. Please click around as we feel like we have added a lot of helpful information. This is a work in progress so please be patient, but we plan to update all sections and add more. If you have any suggestions for something that needs to be added to the website, Please let us know! Last but not least, the PTO is switching gears on fundraising this year and instead of our traditional Boosterthon fundraiser the PTO will be leading its inaugural Capital Campaign. We are still putting the finishing touches on our campaign, but look for more information just after the beginning of school. * Please visit our 2018-2019 Capital Campaign and consider making a donation today!